The First Meeting House in Harpswell Center, completed in 1759, was the original gathering place for the town. In early 1843, local architect Anthony Coombs Raymond designed a new church using a combination of Greek and Gothic Revival elements. Built by master joiner and Harpswell native Moses Bailey, it was dedicated in the fall of 1843 and later named in honor of its first minister, Elijah Kellogg. In the early 1960s the original sanctuary was raised up to allow for the construction of classrooms and a fellowship hall. In 2000 a significant addition, with more classrooms, and a larger fellowship hall was completed. Unfortunately, time and deferred maintenance took a toll on the building and in 2013 an effort to restore and preserve the Elijah Kellogg Church started in earnest. A comprehensive approach was required to address a multitude of systemic problems, including mold, drafty windows, flaking layers of lead-based paint on the exterior, and rot in the belfry and steeple, as well as in the millwork framing the church’s arched doorway. The scope of the project also included improving access to the entrance by replacing wooden entrance stairs, a ramp and walkway, all of which suffered from rot and were deemed safety hazards. The overall intention of the congregation was to preserve this historic structure for the future. A campaign, “Threshold to the Future,” was developed with a goal of raising $350,000, but, thanks to outstanding support from the Harpswell community, fundraising exceeded that target! 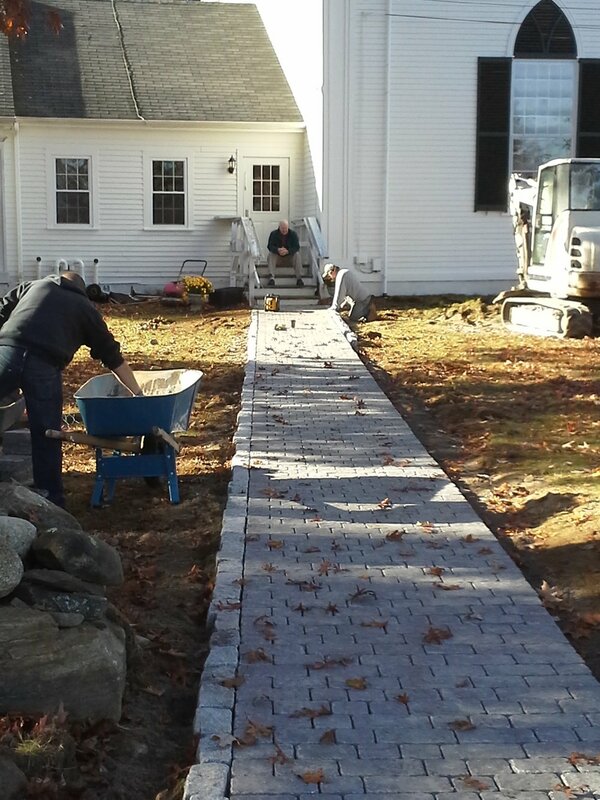 With funds in hand, the church’s Preservation Committee, led by congregants with decades of experience in carpentry, woodworking and national preservation efforts, took the lead and oversaw the project. Multiple other committees involving much of the congregation worked in tandem to ensure its ultimate success. The project began with the removal and restoration of the sanctuary’s 20-over 20 windows. The steeple, bell, weathervane and decorative accents were all assessed, leading to the removal of vinyl siding and the installation of two eight-foot-long braces to support the belfry as well as the replacement of the bell’s rotted framework. Unexpectedly, a bent roof timber was identified, requiring roof removal, timber repair and reattachment. Layers of paint were removed from the clapboards, as well as the shutters and louvered arches. Additionally, the church’s entry was made more accessible with a granite porch and steps, and a concrete, paver-surfaced ramp with iron railings. To contain lead levels, pews, walls and ceilings were repainted, and new carpeting and pew cushions were installed. This community-based preservation project has met or exceeded the Congregation’s ambitious goals. Today, the church thrives as a religious magnet, and serves as the setting for countless concerts and community events. It remains a shining example of quality workmanship - both that which went into creating the historic structure in the 19th century, and that which recently made it new again.